The American Metalcraft BD65 Balti dish has a 32-ounce capacity for serving bread or family-style dishes. Large side handles ease lifting and carrying, while a mirror finish gives tabletops a clean, upscale feel. 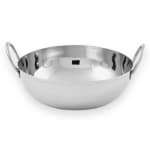 To provide durability and corrosion resistance, the bowl is made of stainless steel.